I travelled the 194 miles (313 kms) home from Killarney to Dublin last evening with fond memories of my two days at Bikefest 2014. There were plenty of wonderful bikes on display, and the highlight for me was the parade through Killarney (see video below). 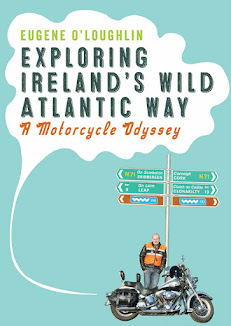 I was there of course to promote and sell my book "Exploring Ireland's Wild Atlantic Way", but I did get the chance to see lots of bikes and chat with many bikers. On the left of my stand was the Christian Motorcycle Association, and I was honoured to have my bike blessed by their chaplain. To my right were Tallaght Powdering Coating where I got to chat with the owner (Andy) , and I will definitely think about the services for powder coating my wheels when the rust takes over. The coolest bike at the show! The video below (via jason gnanam) is taken in College Street in Killarney, and gives an idea of the number of bikes that took part in the parade (that's me passing in the orange vest 3rd behind the trike at 4 mins into video).